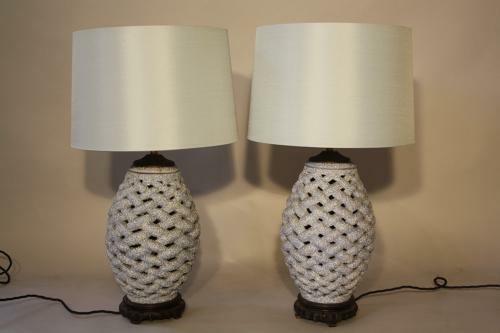 A very unusual pair of pale speckly blue and white criss cross ceramic lamps. Wonderfully executed in design with pierced detail these lamps sit on carved Chinese hardwood bases. French c1950. Height to shade is 61cm and without shade is 45cm. The widest diameter in the middle of the lamp is 20cm. Price includes pale blue shades. Fully rewired and PAT tested for UK use.